All too often, pit bulls get a bad rap. In fact, negative stereotypes about pitties - that they're aggressive or dangerous - are so prevailing that in some places these days the dogs have actually been banned. But long before all that nonsense about them being a "problem breed," one lovable pit bull in particular was proving they could be quite the opposite - a celebrity. During the nascent days of cinema, when filmmakers were only beginning to explore the possibilities of the medium, an unlikely actor emerged as a silver screen pioneer. His name was Mannie: "the first cinematographic dog star." In 1901, Mannie starred in a Thomas Edison film titled "Miss Laura Comstock's Bag Punching Dog" -perhaps the first film in which a canine took center stage. 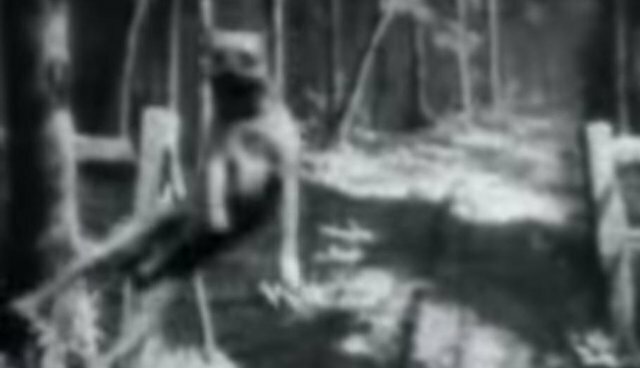 The 110-year-old footage is grainy, but it's clearly a celebration of what a happy, bouncy and clever pit bull he was. This wonderful dog "Mannie," owned by the vaudeville star, Miss Laura Comstock, is a most learned animal. He has been trained to perform all sorts of tricks, and his intelligence is, perhaps, most marked in his latest and most difficult feat, that of punching the bag. This picture depicts him in a bag punching performance which is really wonderful. His high jumps and lightning-like punches are remarkable and cause one to marvel at the amount of patience that must be necessary to teach a dog such tricks. After this early success, Mannie went on to play a role in several silent films, including under the stage name "Tige" in this charmingly antique clip from 1904, "Buster and Tige Put a Baloon Vender out of Business." To learn more about Mannie's career and to see more clips from other early pit bull movie stars, click here.